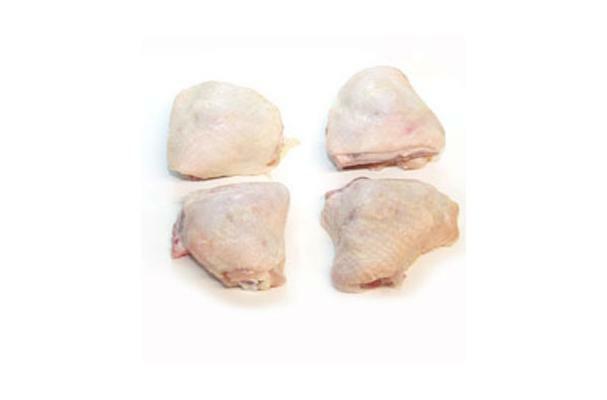 A chicken thigh is the meat from the thigh of the chicken and is used in recipes, with boneless and bone in varieties. One chicken thigh is about 4 to 6 oz. The meat is referred to as, "dark." There is a higher moisture content and fat content than chicken breast meat. It cooks rapidly, and retains moisture well, even when braised and or stewed. Choosing: Check the color of the meat. It should be creamy white/yellowish or a little pale pink. Never buy a chicken with pasty or gray skin or meat (Except for Silkie chicken because Silkie chicken meat is black). Check for the date when the chicken was butchered.Smell the chicken, a bad smell means the chicken is already spoiled. Buying: Buy at any supermarket or butchers'. The best are organically raised. Buy chicken that is just enough for your family. It is best to cook fresh meat. Always wash the chicken before cooking. Make sure you wash and clean the chopping board and knife you will be using to avoid cross contamination. Brining the chicken parts1 - 2 hours in advance helps keep the meat soft and juicy even when roasted, grilled or deep-fried. Cleaning: Thoroughly wash chicken parts, remove the skin or any fat if you like. Store any chicken meat in a sealed plastic bag or plastic container inside the freezer if you are not going to use them immediately. Always store the chicken in the coldest part of your fridge.